2 soveværelser, første sal lejlighed med en rummelig privat tagterrasse. Beliggende i en fantastisk arabisk inspireret kompleks med 4 swimmingpools. Smukt og moderne indrettet med en lædersofa, SMART TV og DVD og et fuldt udstyret moderne køkken med opvaskemaskine og mikrobølgeovn. Gratis Wi-Fi til rådighed i hele lejligheden. Soveværelserne kan sove op til 5. Bomuld, sengelinned og håndklæder leveres. Beliggende ved siden af ​​ny Baku Water Park, marked, bowlingbane, caféer, barer, supermarked, butikker og El Campanario Centre. 5 minutters gang til byens centrum. Fantastiske strande og klitter minutter væk fra lejligheden. En fantastisk moderne, smukt møblerede lejlighed i en fantastisk kompleks! Badeværelse med bruseniche, toilet og automatisk vaskemaskine. Noter om indkvartering: Mid ferie ren for gæster opholder sig to uger. Udenfor: Denne fantastiske kompleks har 4 swimmingpools i smukke haver. 2 er fuld størrelse og 2 lavvandede pools egnet til børn. Rengøring / håndklæder / linned / stuepige service: Bomuld, sengelinned og håndklæder leveres som skiftes ugentligt eller oftere efter anmodning. Andet: Bedøvelse rummelig og privat tagterrasse har 3 liggestole. Dette er det perfekte sted at arbejde på din tan. Terrasse har en fantastisk udsigt til Lanzarote, Lobos, klitter hav, Baku Water Park, kompleksets swimmingpools og haver. 3 liggestole, bord og 6 stole. Glad you enjoyed your stay in our spacious apartment. Kettle has now been replaced. I have stayed on El Sultan complex before and really like the location. A thirty minute stroll to the harbour and a few minutes from the sand dunes in The National Park and onto gorgeous beaches on which you can walk for hours. There's a big supermarket, pharmacy and cafes 5 minutes away; the bus stops for El Cotillo and Puerto del Rosario are two minutes walk. A very quiet location in the low season. The apartment is spacious and well presented, and the big roof terrace amazing (though accessed by stairs outside of the apartment). The TV worked and we got an English channel. There were good, warm covers for the beds which are essential in the winter. the wifi did not work (we accessed a neighbour's though!) and judging from reviews back to 2015 this is an ongoing problem which needs fixing. As a previous reviewer noted, the oven is greasy and needs a good clean or it makes the whole place a bit smelly. We were given two small bath towels and two hand towels for two of us but a hand towel for the bathroom, bigger towels, pool towels would have been appreciated. The apartment details mentioned 'pantry items' but apart from a few sachets of tea and coffee, there was nothing so we had to buy salt, pepper, oil, vinegar. I always travel with a bag of spices but assumed there'd be salt and pepper so that was a bit annoying. We were given one tea towel and one toilet roll so had to also buy loo rolls, kitchen towels, paper napkins, cling film, washing up liquid and a sponge. We didn't use the dishwasher but would have had to buy salt and soap tabs for it if we had. It is a bit annoying to have to buy cleaning products etc for a one week stay though I don't mind if I have a longer let. A bottle of water in the fridge would have been nice too especially as we arrived at 9pm (fortunately HyperDino opens until 10pm). Nonetheless all these points are fairly minor and our overall stay was excellent. Richard, 'our man on the spot', was helpful and pleasant. Glad you enjoyed your stay in our apartment .This is a self catering apartment and hence the need for guests to provide their own food and essentials. Wifi on the island remains a problem but we have in general a satisfactory service sufficient to operate the Smart TV , Netflix etc. As most people now have free wifi on their phone when in Europe if the internet is low people use this. Will contact caretaker about leaving out more towels for guests.His number is on the Welcome Pack and all all guests should contact him if there are more supplies required. Delighted that you enjoyed your stay.We too love our apartment and are delighted that you did too! Just back from 25 El Sultan after a lovely break. Service excellent from start to finish. Very easy booking with Martin, met by the very helpful Richard who gave us the tour and all the details of the apartment and nearby services. A lovely spacious apartment with everything you need at your finger tips. Had a small issue with the shower which was rectified immediately with the delivery of a new shower head. Very close to a terrific supermarket, a nice stroll into town or to the beach. A very quiet complex with a beautiful pool. The roof top excellent for a spot of private sunbathing! Would rent this apartment again in a heartbeat. So glad you had a wonderful stay at our apartment.Thanks for great review and we would welcome you back at any stage in the future. - No internet as advertised. Spoke with the caretaker whilst there, and he said a bill was missed in July and they were cut off. Promised we would have internet back but never did. Whilst this would not be an issue for many, I was unable to work from the apartment on wifi and as a result had to incur big charges from my mobile phone provider to get on the internet. - Mould around the shower sealent that could be rectified easily. - The oven was not usable. We attempted once to cook a meal, but the smell of stagnant/burnt oil from years of use filled the apartment with smoke/fumes which made some of us feel sick, and I was concerned for my pregnant wife. The overhead extraction fan did not aid in reduction of fumes. - The beds were some of the most uncomfortable beds I have ever slept on, and I can sleep on anything. The metal frames did not hold the slats very well so on a daily basis we would have to take the mattress off and reseat the slats that fell out. The mattress was very firm, so we used a duvet to make it softer. This apartment is in a great location if you have a car or like a 20min brisk walk into the strip. The apartment is in a lovely complex but is let down by a few of the easily rectified issues above. Would I go back again and stay in the apartment? Yes I would if the beds were updated and the cooker given a good clean or replaced. The other things are just bits and pieces that are easily overlooked if you dont mind a bit of mould/dust. Thanks guys for an enjoyable two weeks. I apologize for lack of Wifi during your stay but I personally whilst there in August for some weeks afterwards endeavored to have this problem rectified. Things in Spain happen beyond slow but I am glad to say the Wifi is now fully operational. Comments re cleanliness are always passed on to my caretaker but though his number is supplied to all clients this matter was not raised with him. I personally cleaned the oven on numerous occasions during my 6 weeks there last Summer and the shower was newly installed in August 2014. Never had a comment re beds before from previous guests that have stayed .Overall while though this review does not match the other 4* and 5* reviews by other previous clients it is most interesting that you would return ! This is a very relaxing and quite complex. It's secure with access through two gates and is within walking distance of a beautiful shopping centre with supermarket, restaurants and tapas bars. 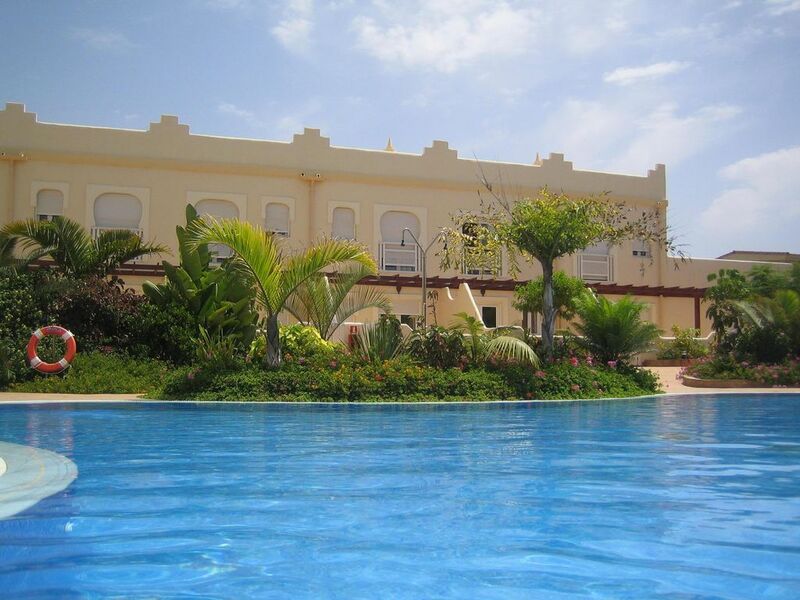 The apartment is lovely with all you would need for self catering if you wanted and the pool is beautiful and very tropical with amazing planting. The water park is within view from the apartment and cabs can be got from the shopping centre to the beach or town. So glad you liked the apartment and the complex. We too love it there !! Denne lejlighed er minutter væk fra de mest fantastiske strande i Europa, som omfatter Flag Beach (10 minutters gang) - fantastisk for vandsport, surfing, windsurfing og kitesurfing og Olivia Beach, som strækker sig 7 km og er hjemsted for de mest fantastiske sandklitter. En naturist område for dem, der ønsker at opnå en "all over tan" ligger ca 1 km fra Olivia Beach Hotel. Denne strand er adgang til ved taxier (3 €. 50 pr taxi), bus (€ 1 pr person) eller 5 min i bil. Der kan arrangeres transport til lufthavnen. Lokale cafe, barer, butikker og bank med ATM-maskine er en 4 minutters gang fra denne lejlighed, som er El Campanario Shopping Centre. Baku center, som omfatter et vandland, marked, bowling, bingo, et hjemsøgt hotel, amerikansk diner, piratskib og butikker er en 6 minutters gang væk.